Are you running or starting your own law firm? This is your podcast. Partner up and maximize your firm. 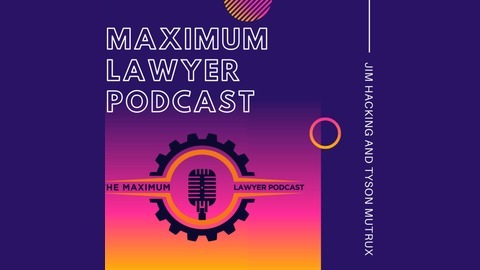 Visit MaximumLawyer.com for complete show notes of each podcast episode, tips, hacks and more resources! Today on the show we have Oli Billson, lifelong entrepreneur and marketing legend. He’ll also reveal some of the biggest business myths that are being perpetuated through books and social media you’ve probably consumed, as well as how he structures his time as he runs his multiple businesses. Hacking’s Hack: Grab your iPhone or your Samsung and look at your messages-scroll down to the very bottom as far down as old as you can get on your messages find people that you haven't connected with in a while and just send them a quick text letting them know that you're thinking about them. Tyson’s Tip: About two years ago, I started ordering from National Pen Company and people are always asking about you know, where do you get your merchandise things like that? They have high quality merchandise pens, notebooks, things like that and they're really inexpensive. I highly recommend them-National Pen Company. Worst case scenario is if you get on their mailing list, every two weeks they will send you a sample product in the mail. I just got like a notebook in the mail from them. Its actually branded with my firm's information on it, and I get something every two weeks. Make sure to register for MaxLawCon19, June 6 and 7 in St.Louis. Interested in being on the show? Shoot us an email at support@maximumlawyer.com or message us on Facebook! 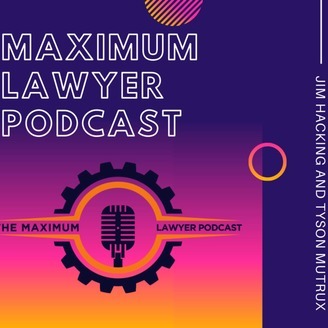 Welcome to the Maximum Lawyer Podcast. Partner up, and maximize your firm.